On September 12, 104 women were arrested for blocking an intersection outside the Capitol Building as part of a demonstration to demand that Congress pass comprehensive immigration reform. Organized by the We Belong Together initiative, the protest highlighted the special burden faced by women who struggle to maintain their livelihood and hold their families together in the face of our unjust immigration policies. Women and children make up 75% of the undocumented population, but the legislative proposals for reform have not done enough to protect their civil and human rights, or to address their particular needs. Twenty-eight of the women arrested during the protest were undocumented, and in joining the action risked not only criminal charges and incarceration but also subsequent deportation. 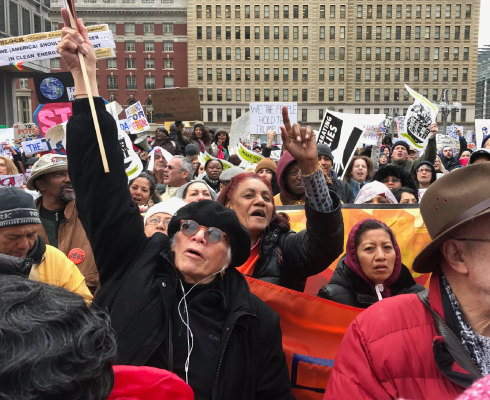 Also among the protesters were representatives from many of Center for Popular Democracy's (CPD’s) partners and allies, including CASA de Maryland, the National Domestic Workers Alliance, the Workers’ Defense Project, CHIRLA, NOW, The Black Institute, the NAACP, and many others. CPD’s own Staff Attorney Emily Tucker was also arrested during the action. As the women formed a circular human chain outside the Capitol Building chanting “Si se puede” and singing “We Shall Not Be Moved,” a group of 70 children made their way inside to deliver heart-shaped cookies and 6,000 petitions from children and women to the offices of Congress members, demanding legislative action.